"The perfect black levels in these OLED TVs make them irresistible"
Only Sony and Samsung's very best, top of the line 4K full local dimming models can come close to matching the new OLED TVs. But they really dont come close to the G6P. The black levels are perfect, and color information just leaps off the screen. LG's new 4K line of OLED TVs won our Best of CES 2016 award for the second year in a row for best picture in the market. Why is OLED technology better than LED/LCD TV in Picture Quality? If I had to answer this question in a word: Contrast. First and foremost OLED TVs do not contain the “twisting” crystals found in all LCD based TVs (including LED TVs). Instead of producing color information by way light passing through these prisms of crystal glass as they turn at incredible speeds, color information in OLED TVs is produced from organic carbon based compounds, which emit green, blue and red lights in response to electric current. This is actually more akin to the way plasma TV phosphors work than the twisting crystals in an LCD. There are no additional light sources necessary to energize the organic color compounds than this small electric charge. Interestingly, a small part of OLED TV technology is taken from the CRT TV. 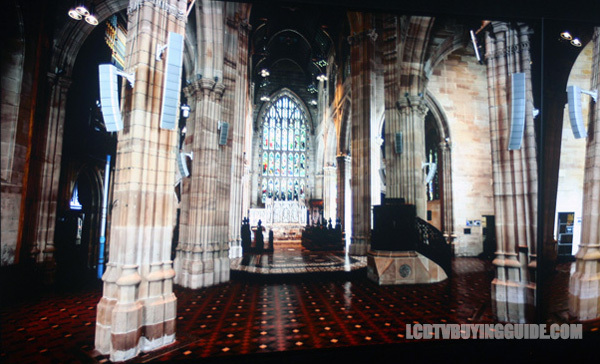 OLED TVs have a cathode layer to provide the mentioned electric charge to the pixels. Back to picture quality. 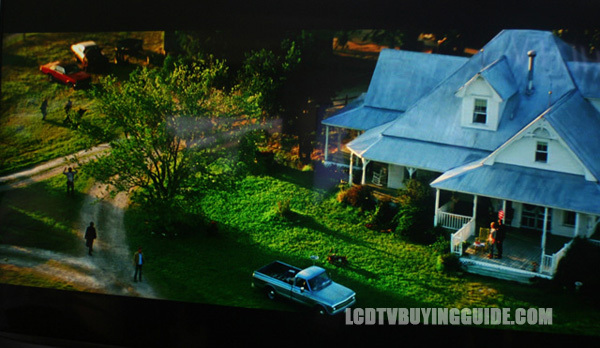 Due to the backlight used to illuminate images on an LCD TV, there is less flexibility in producing black or very dark scenes. There must always be a flowthrough process from the backlight, through the LCD. There are various ways LCD panel manufacturers attempt to accomplish deep black levels but let's suffice it to say that they all fall well short of the effortless and perfect black levels of OLED TVs. All the OLED has to do to present perfect black is cut the power to any individual pixels. Since there are over 8M pixels in the new 4K OLED models, you can well understand how vast the contrast ratio is even in small individual areas of the screen. Illuminated colors pop much more off of this platform, making them look more vivid and alive even when properly calibrated. While there are some slight advantages of LED backlit LCD TVs in potential brightness, peak whites, and video processing, they easily eclipsed by the contrast, color and black presentation of OLED TVs. 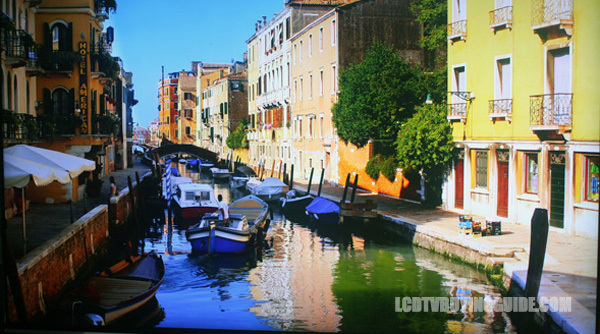 See our complete discussion on OLED vs. 4K. When you view an G6 next to a 4K LED TV, the first thing you notice is the immense and infinite black levels of the OLED TV. Yes, 4K LED TVs can still pump out a brighter picture due to amped up LED backlights, but it's no comparison in depth of blacks. Now for review, you videophiles know that brighter LED backlights in the store can look great, but get it home in a lamp-lit room and you start to see all the flaws (and turn down the backlight setting). As mentioned above, you also remember that deeper black levels create colors that pop more and more contrast on the screen. Essentially to make my point simple, black levels win out over brightness in picture quality performance importance. OLED TV wins out easily against 4K LED in this very important category. I'm not entering into a discussion about the maneuvers like Quantum Dot/ Nanocrystal layers that 4K manufacturers are employing to try to equal OLED in color performance. Instead, just know that they are doing everything possible to try to compete with OLED in performance, which means OLED is better right? Yes, that's right. The G6 has incredible deep pitch blacks and the best looking colors you have ever seen in terms of brilliance, depth, saturation, and contrast. There is just something, “better than this world” about the colors on this OLED TV. Color's are extremely accurate both before and after calibrating. "Since OLED TVs do not suffer from this problem, why make them curved?" Another area we always highlight is off center viewing contrast and color saturation. With OLED and the G6P it's perfect just like it was with good plasma TVs, because every pixel is lit organically (and with an electrode) so there is no backlight. On the G6P, LG went a step further and applied the pixel directly to the back of the glass panel to give even more umph.Let's just say that side angle viewing is perfect no matter your viewing angle. The light comes from the panel itself. The big focus TV feature for 2016/2017 is HDR (High Dynamic Range). HDR extends the range that a pixel in an LCD or OLED TV can show. This applies to the brightness and luminosity of images. Contrast is enhanced by increased brightness rather than deeper blacks. Rather than just increase the brightness of the picture overall though, the real purpose of HDR is to increase contrast in various image areas of the picture. It improves the presentation in the brighter parts of the picture and this creates more contrast with surrounding darker parts of the picture. Since picture contrast is one of the primary features in improving perceived depth, HDR is considered a major picture quality improvement even though it may not increase the overall contrast of the panel a lot. Bright colors receive enhanced purity. A good HDR image will show better shadow detail, and the scenes that you will notice the most are those with light illuminating images, especially outside sunlight effects or a room that has sunlight coming in through a window and illuminating parts of the room. HDR content is and will be in short supply for a while. With little HDR content available except a few programs on Amazon which are not well rendered, we'll reserve judgment on HDR performance on the E6P until later. Video processing and conversion is one of the drawbacks to picture quality, really the only drawback. There are motion artifacts present depending on the signal source and strength (if streaming). This is the one clear advantage to LED/LCD TVs in my mind; the best ones do smooth out images better than OLED TVs. It must be more difficult for the OLED technology to process images more similar to plasma TVs in this regard. As you probably know, the 4K UHD resolution does not do you any good if you cannot enjoy the higher resolution. Therefore, up-scaling 1080p, and 720p and lower resolutions becomes probably the most important point in purchasing a 4K UHD TV due to the dearth of original 4K content. We give the G6P up-scaling performance a B-. We note the introduction of more artifacts in lower end signals 720p, 480p, 480i. With 1080p picture noise cleared up but was still noticeable. The truly infinite black OLEDs can pull off is really shown off in this image. Some may not like the appearance of the speaker on the bottom of the TV. It does greatly enhance sound quality, but aesthetically you have to sacrifice a bit. The G6P is a gorgeous looking very high end TV. A lot of the extra cost for this model over the G6P is from the design elements. For example the stand flips back behind the TV if you want to wall mount it. It's 2.6” deep for wall mounting, but very thin if on the stand. 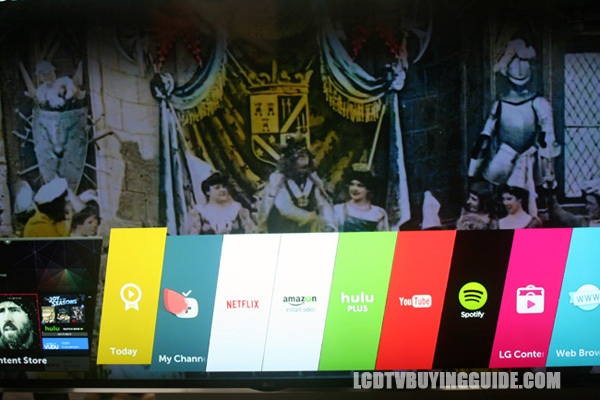 After taking flack from us and others two years ago, LG has put effort into speeding Smart TV function with the first WebOS and now WebOS 3.0. Boot up times are fast, and this is either the best or one of the best Smart TV systems out there now in terms of speed, and user interface. 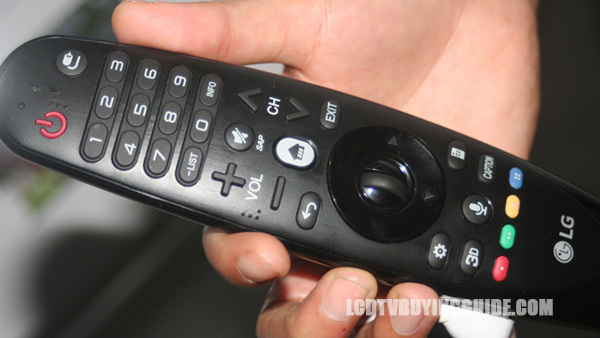 The interface layout is straightforward and more intuitive and makes sorting your favorite programs very easy with the point and click operation of the new LG Magic Remote (we love the Magic Remote). The ability of the user to order and place the various Apps that matter most is a considerable strength over competing systems. Overall, WebOS provides a painless, and enjoyable experience. The one knock is that Samsung's Tizen, Android and Roku do offer more Apps selection, although LG will have nearly all of the major Apps that are considered important. Smart TV options are Netflix, Amazon, YouTube, HSN, Showtime, Drama Fever, iHeart Radio, and newly DirecTV, and GoPro. The GoPro Channel App is only available to LG webOS and allows LG TV owners to stream GoPro videos on-demand. The one I like for you cable-cutters out there is Sling TV, which for a monthly fee ($20) gets the all important ESPN and ESPN 2 taken care of. It also gives you the addictive and entertaining Food Network. IheartRadio is an digital audio service which allows streaming of live radio stations. We like the new Magic Remote even better for speed and easy functionality. The point and click operation is excellent and efficient. LG puts good focus on sound quality and realized that not everyone is going to go out and get a sound bar or surround sound system. I prefer this approach and I'll gladly sacrifice a little aesthetic appeal in the TV with the obvious bottom mounted speakers, to get good sound without the need for a sound bar. The G6's speaker system is designed by Harmon Kardon and delivers 40W of output. Background noise and voice separation are noticeably more distinct and there is plenty of volume to fill a large room. Excellent 3D quality using 4K resolution and OLED panel sets the new standard for performance. This is the best quality 3D experience we've seen. Even though 3D is fading in popularity and focus, it's a nice feature to have. Naturally if you are going to spend the money on an OLED TV you want to know that it is future-proofed. We've got HDR and 4K to consider and who knows what new technology down the road. The G6P supports the latest and greatest HDR10 as well as Dolby Vision HDR. It's good to be versatile as you never know which technology will get adopted. Right now, Sony and Samsung are supporting HDR10 and this is the format for 4K HDR Bluray. Dolby Vision HDR is not upgradeable, so it's good to know it's there at the start. This is the preferred current streaming content format. Value is not the strong suit of this premium TV. The picture is incredible, and my favorite in the market so if you can afford it – this is your TV, this or the E6P if you want to save a few dollars.